Kishore Chhabria prefers to shun the limelight. "My brother would feel uneasy if he was not talked about in the press. I feel uneasy if I am," he says. He is referring to the flamboyant Manu Chhabria, whose career saw dramatic crests and troughs before he passed away in 2002, and with whom Kishore himself had a stormy, mercurial relationship. But the limelight will not shun Kishore. He has often been in the news for the past two decades, either for his corporate battles with his elder brother or with the Vijay Mallya-led UB Group, or his tangles with the Enforcement Directorate and the Securities and Exchange Board of India. Chhabria is being talked about because his whisky brand, Officer's Choice, has emerged the largest selling whisky in the world in 2011, ahead of even global spirits' giant Diageo's Johnnie Walker or local heavyweight UB Spirits's McDowell's and Bagpiper. Ask him why Officer's Choice succeeded and he mentions luck and destiny before coming to hard work. "Why did Kolaveri succeed? Or Gangnam Style?" he says, referring to the two recent YouTube sensations. But his personal effort and - equally important - tenacity played their part too. "Everyone tried to kill the brand through neglect and yet it survived," he says. 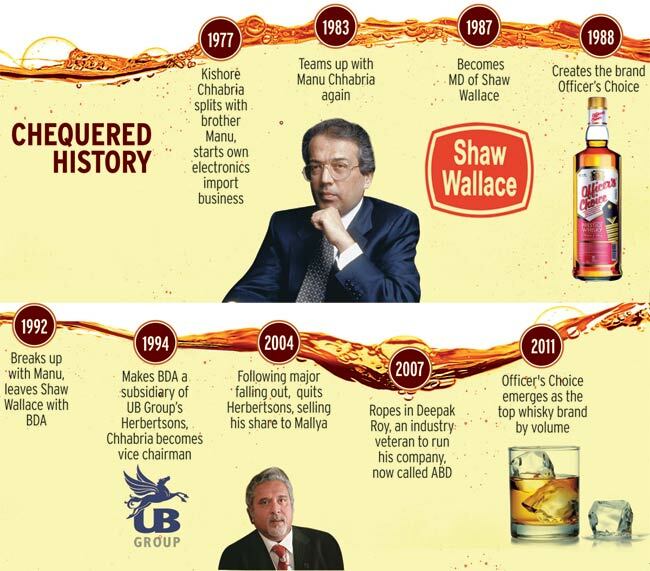 Officer's Choice was born in 1988 when Chhabria, then managing director of Shaw Wallace Co. (SWC) noticed that all the attention in the company was being given to the frontline brands. To boost the neglected ones, he decided to set up a separate division for them based in Delhi, though SWC was headquartered in Kolkata. To provide a complete portfolio of spirits to this new division, he created a new whisky. Chhabria wanted to combine affordability with class. "The idea was to provide a feel of high status to a product that was priced low," says Arun Nanda, CEO and Managing Director of advertising agency Rediffusion DY&R, which coined the name and designed the packaging. "Therefore the name Officer's Choice, and the naval officer stripes on the packaging. You could serve it to your friends and they would not feel you were serving a cheap whisky." Even today, a bottle costs between Rs 250 to 400, depending on state level taxes. But early success is no guarantee of smooth sailing. Chhabria became MD of SWC thanks to Manu Chhabria who, on an acquisition spree in India in the 1980s had taken over SWC, but thereafter returned to Dubai where most of his other businesses had their headquarters, leaving Kishore in charge. Differences, however, soon developed between them. The Chhabria brothers had never really grown up together, since Kishore was brought up by his youngest uncle M.D. Chhabria and his wife, who were childless and who virtually - though never legally - adopted him, while Manu lived with the parents. "We were more like friends," says Kishore. "We joined hands in 1975 for two years and then again in 1983." Ultimately Kishore pulled out of SWC, forming his own company BDA Ltd, taking Officer's Choice with him. Kishore then joined hands with SWC's biggest rival, Mallya, making BDA a subsidiary of Mallya's Herbertsons Ltd, in return for a 26 per cent stake and Kishore becoming vice chairman. But that tie-up too floundered, with each accusing the other of trying to take over the company by raising their stakes, and Kishore finally walked out taking BDA and Officer's Choice with him, selling off his share in Herbertsons to Mallya. But much acrimony remained, and after Mallya acquired SWC in 2005 from Manu Chhabria's family, he revived an old legal battle over control of BDA and Officer's Choice. The dust finally settled only in October this year, with Chhabria paying Mallya Rs 8 crore. Much before this BDA had been transformed into a new company, Allied Blenders & Distillers Pvt Ltd (ABD). Why the change? "BDA was named after a man called Bishambhar Das Agarwal who had set up the corporate entity. It meant nothing," says Chhabria. "So after Herbertsons, we went to audit firm Pricewaterhouse-Coopers and restructured our business. We took on a new name though the acronym has the same letters." One man played a key role in Officer's Choice's rise after Chhabria broke away from both Manu and Vijay Mallya. 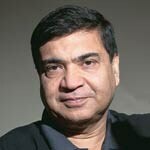 This was industry veteran Deepak Roy, who had built a formidable reputation during earlier stints at both the UB Group and Diageo, and whom Chhabria brought into his fold in 2007. Roy was then running his own joint venture Vallee de Vin, and was initially reluctant to shift. But after Chhabria offered him a five per cent stake in ABD as sweat equity, he agreed. "Officer's Choice is a low profit margin product," says Roy. "Our margin is around Rs 170 a case." To bolster it, and improve ABD's overall margins, Roy created a range of premium liquor brands. These included the whisky OC Blue, the rum Jolly Roger, the brandy Kyron, and the vodka Wodka Gorbatschow - the last named produced under licence from German liquor major Henkell. "OC Blue gets us Rs 300 a case and Jolly Rogers Rs 225 a case," Roy adds. He also changed the packaging of Officer's Choice to make it more attractive. Since he joined, sales - across all brands - have jumped from 6.9 million liquor cases in 2007/08 to 17.56 million cases in 2011/12. Roy has many more plans to consolidate ABD's position. He wants to launch at least two more brands, including one 'super premium' whisky, as well as strengthen ABD's back-end operations. "Most liquor companies in India own 70 per cent of their bottling capacity," he says. "But ABD owns only three of the 36 bottling units working for us." He also wants to set up an ethanol manufacturing unit. "Usually liquor manufacturers produce 30 to 50 per cent of their spirit requirement themselves, while we have to buy all of it," he adds. "We need to invest to have at least 20 per cent." All this will need large scale funding, which cannot come from the company's own profits. For what is now the third largest liquor company in India - after the UB Group's United Spirits Ltd and Pernod Ricard - ABD's profits are modest. In 2010/11 profit after tax was Rs 14.59 crore, up from Rs 5.81 crore the previous year, according to data from the ACE database. Revenues were Rs 510.42 crore and Rs 231.65 crore respectively. Chhabria has been investing substantially in the last four to five years. "Around Rs 300 core has been pumped into the company," he says. "I've put in around Rs 170 crore myself." But clearly more is needed. He has been meeting private equity funds to raise around Rs 500 crore. "I would have gone in for an initial public offering now had market conditions been better," he says. At 58, Chhabria maintains he has not given much thought to who his successor will be. "The company has done well because it is professionally managed and Roy and his team have complete control," he says. "I do not plan too much for the future." Is his son-in-law, Jeetu Hemdev, likely to be chosen? "He is training under Deepak Roy," says Chhabria. The immediate challenges will be faced with Chhabria himself at the helm. He is already preparing for hard work. He has turned teetotaler, put himself on a diet and begun visiting the gym.